A Father and son metal detecting in a Clitheroe farm field unearthed 28 medieval coins. Ronald and his son, James (37), of Nelson Street, Clitheroe, initially started finding coins on the ploughed land near Clitheroe on March 18th. They found more coins the following day and returned a week later to complete the search. Among the silver coins they found were pennies, halfpennies, groats and half groats from the time of Edward I and Edward II, Henry V and Henry VI. The earliest date back to 1351 and the youngest were minted around 1427. Mr Blair, who lives with his wife, Jane, told the inquest he and his son had found all the coins in a 10m square plot. They had also found some lead nails which may have been part of an original container and these had been forwarded to the Museum of Lancashire acting on behalf of the British Museum. He said they had decided to search in the area because there was a medieval church nearby, and because of the proximity to the Roman town of Ribchester. “People like Cromwell have been through the area so it seemed like a likely spot,” he told the inquest. A report from the British Museum said the face value of the coins was five shillings and three pence, equivalent in today’s terms to between £50 and £100. Coroner Michael Singleton found the haul to be treasure. His verdict will be passed to the British Museum who will then contact the finders and the landowner with an offer of a reward for the find. The owner of the land asked not to be identified for fear that unauthorised treasure hunters may invade his farm in search of further treasure. 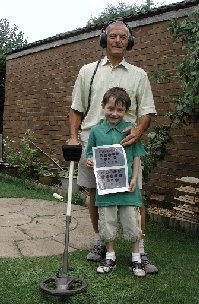 Our picture shows Mr Blair and his grandson, Jamie Angel (6), with the metal detector.